Ever wanted a kitchen space that looked like something that came out from a movie? 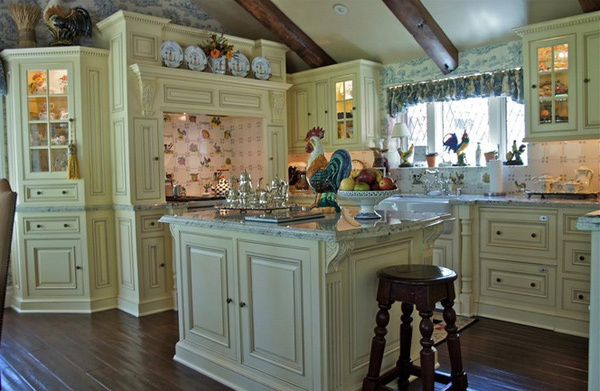 The traditional ones that make you think, how do they have such gorgeous kitchens in that part of town? 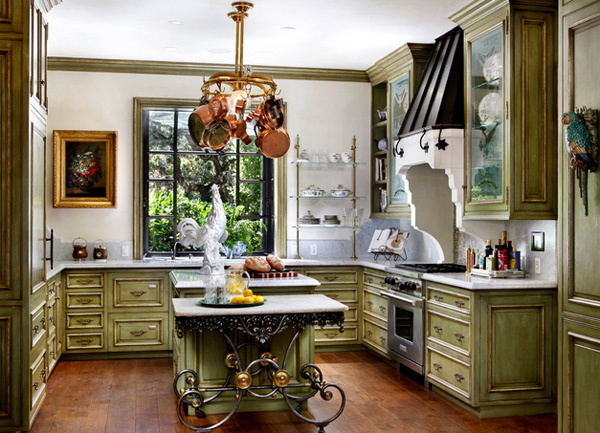 If you do, we have this list of 15 Fabulous French Country Kitchen Designs that will maybe want to you own one. Below is a list that covers designs that use neutral palette for majority of the space, and we are pretty inspired to share them with you because they are just stunning, worldly and at the same time homey. Comfort in your own kitchen means being able to create lovely meals for the family or for yourself and the same time be able to make others want what you have going on. 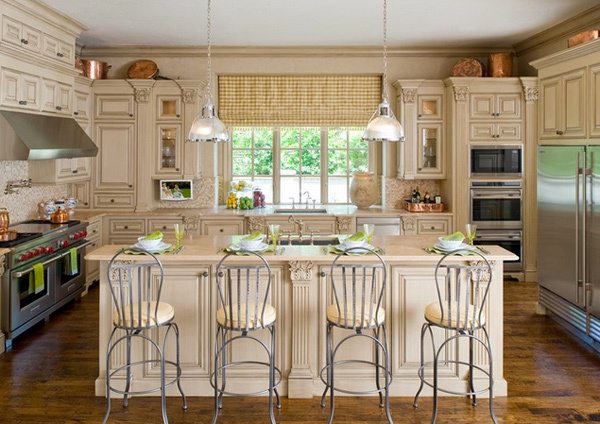 With that in mind, take a look at the 15 Fabulous French Country Kitchen Designs we have collected for you below. 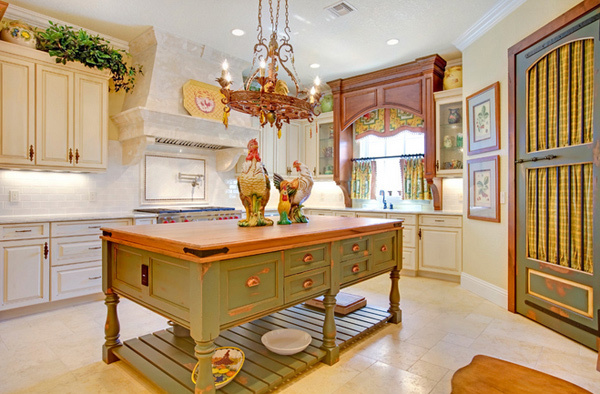 Just look at the stunning range that this Austin kitchen has. 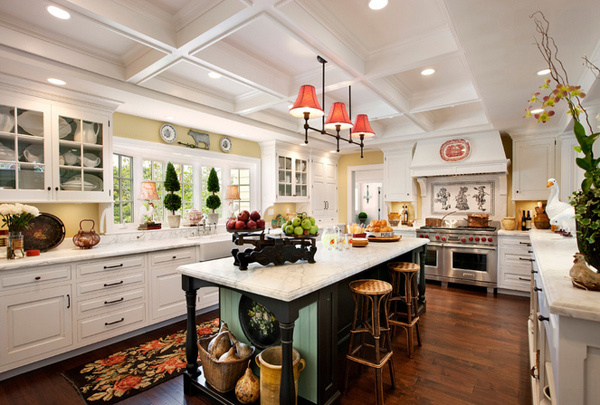 The cabinetry is awesome and really fresh and beautiful. 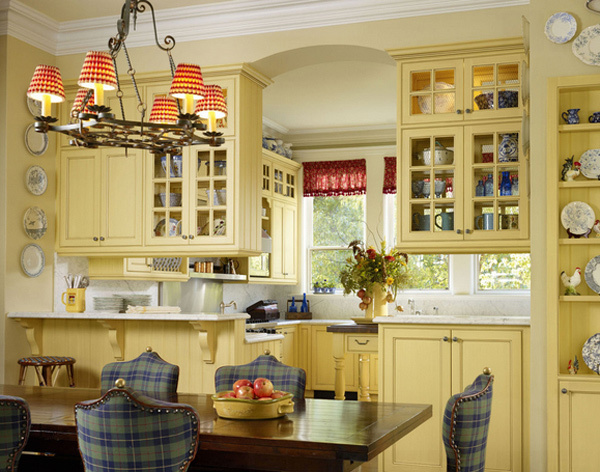 This kitchen and dining area comprises a trio of primary colors. Yet the nuances in the palette take them into more sophisticated territory: creamy yellow, rich red, muted royal blue. Because the stronger colors are used only in small dabs, they don’t overtake the laid-back attitude of the space. Whatever is surrounding the range is just fabulous! 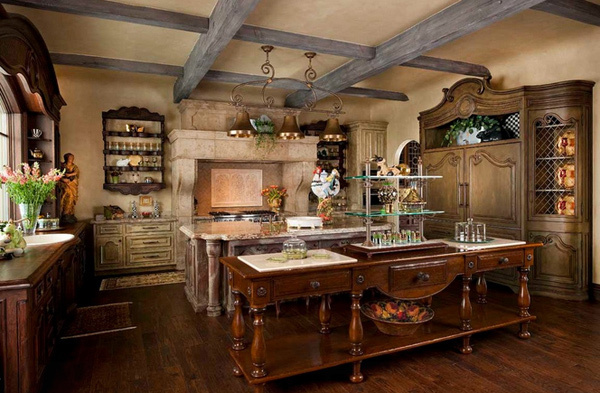 The rustic touch to this French kitchen is creative and quite fancy, don’t you agree? How do you find the copper feel to this kitchen space? 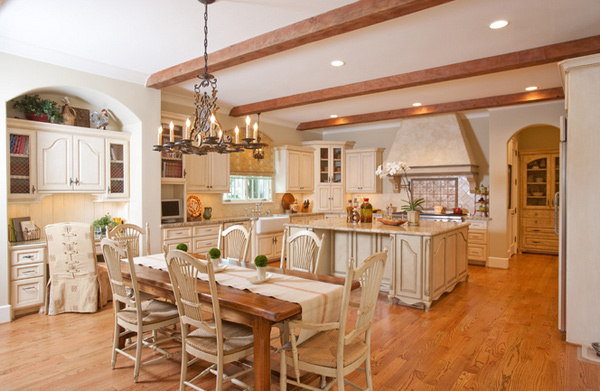 The light colored walls complement well with the darker colored cabinetry done with this space. Though it started out as an upholstery fabric, these days it’s just as likely to be a wallpaper pattern. 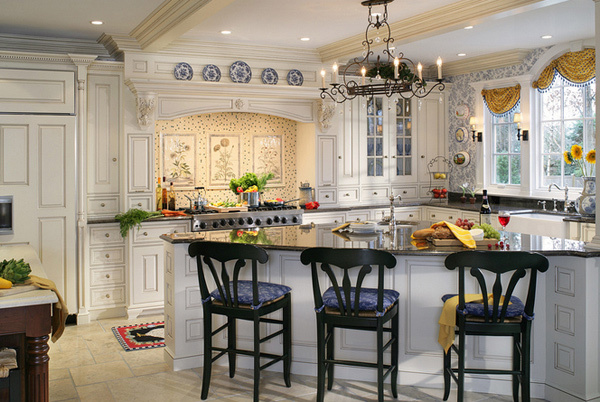 Elegant Sophisticated French country kitchen with custom hood, mosaic backsplash, turned pilasters from Canterbury Design. French Country: If you don’t already, you’d want to live in rural France surrounded by white, elegant furniture. Your furnishings are formal but functional. 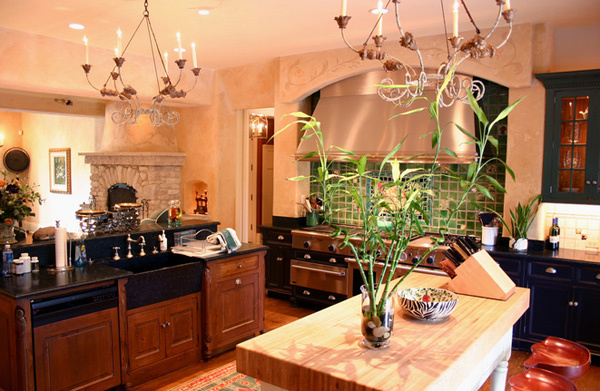 Another beautiful example, complete with a separate stone fireplace to add to the traditional nature of this kitchen. The size of the range hood is balanced beautifully with the other details in this space – fabric shades to soften, and light grey-blue island cabinetry and stone as color counterpoint. K & M Designs, Inc.
There’s such a glut of rooster-themed bric-a-brac on the market that it’s easy to get caught up in the madness and end up with a space that’s more Old MacDonald than old France. Instead, pick one or two pieces, such as a kitchen rug, a cookie jar or a painting. 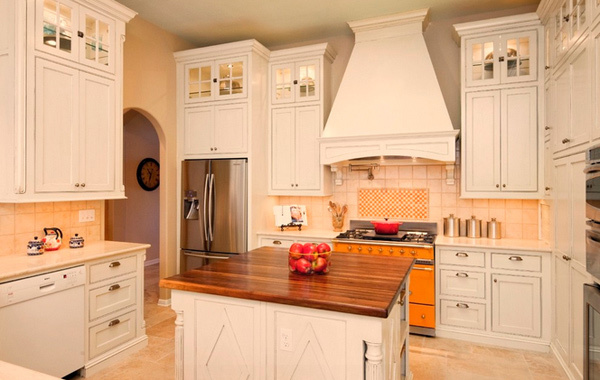 This Dallas kitchen sure has the right colors to it. 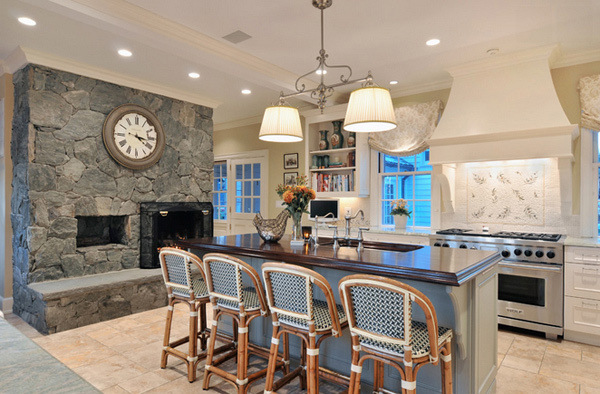 We like the pendant lights and the kitchen bar stool choices. How do you like the window treatment? It’s fun and somehow energetic. 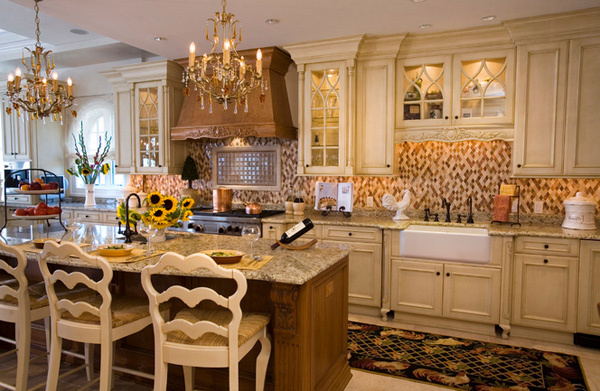 The color palette for this kitchen is stunning. The new space plan eliminated the peninsula that divided the two rooms, incorporating a large, center island, bench seating in the breakfast nook and furniture style cabinetry throughout. The ceiling was raised by six inches, removing an unnecessary soffit and creating an overall bigger space. 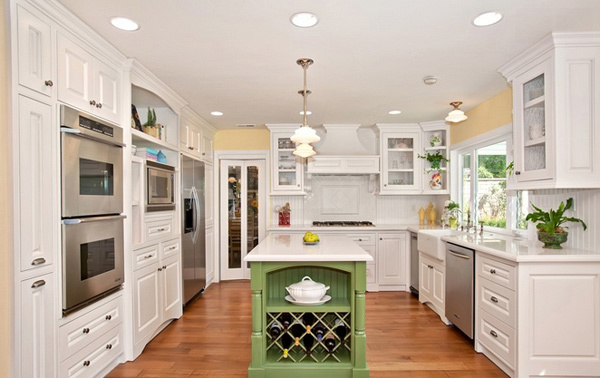 Green cabinets, scroll design on small island, pan holder/light fixture, vent hood and star brackets. The windows and counter, size of kitchen, not the island unless it is white also (but size and shape are great), and not the handles on the cupboards. Put glittery lights in place of orange ones. No colored tiles over stove – just raised white design. More windows and fewer upper cabinets on outside wall. Wasn’t that an amazing list we just had? Just like having steak for dinner? 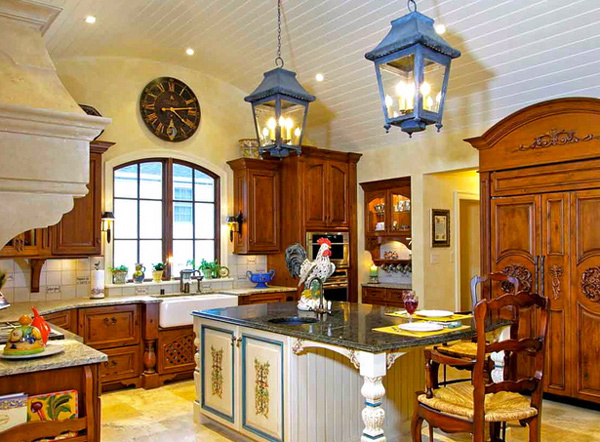 The 15 Fabulous French Country Kitchen Designs is surely one list to check out on later on in the future and think, “We are getting one just like this.” We sure hope you loved this list and that you are looking forward to seeing more of Home Design Lover. Do check out, the 15 Burlap and Upcycled Ottomans for French Country Interiors and hit us with those comments!